In the debates that deal with energy and fossil fuels, it is rather common to read or hear statements such as “oil will last for 50 years at the current rate of production.” You can also hear that “we still have one thousand years of coal” (Donald Trump stated exactly that during the US presidential campaign of 2016). When these statements are uttered at a conference, you can sometimes hear the sigh of relief of the audience, the more pronounced, the surer the speaker appears to be. This reaction is understandable if the assessment of a long duration of fossil fuels were to correspond to what we can expect for the future. But can we, really? 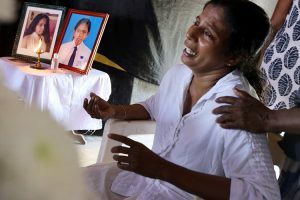 The essence of propaganda, as it is well-known, is not so much telling lies, but presenting only one aspect of the truth. That’s true also for the depletion debate. Saying that a certain resource will last decades, centuries, or more is not a lie, but not the truth, either. These numbers are based on only one aspect of the problem and on highly simplified assumptions. It is the concept of “reserves to production ratio” (R/P), a number that gives you a duration in years of the resource, supposing that the amount of reserves is known and that extraction will continue at the current rates. Normally, the results of these estimates have a comfortable ring to it. According to the 2016 BP report, the global R/P ratio for crude oil calculated for “proven reserves” was around 50 years, that for natural gas about the same, whereas coal was found to have an R/P ratio of more than a hundred years. If the “possible reserves” are added to the estimate, coal turns out to have an R/P ratio of the order one thousand years or even more. Most people understand from these data that there is nothing to be worried about oil for at least 50 years and, by then, it will be someone else’s problem. And, if we really have a thousand years of coal, then what’s the fuss about? Add to this the fact that the R/P ratio has been increasing over the years and you understand the reasons for a rather well-known statement by Peter Odell, who said in 2001 that we are “running into oil” rather than “running out” of it. In this vision, extracting a mineral resource is a little like eating a pie. As long as you have some pie left, there is nothing to be worried about. Actually, the peculiar pie that’s crude oil has the characteristic that it becomes bigger as you eat it. 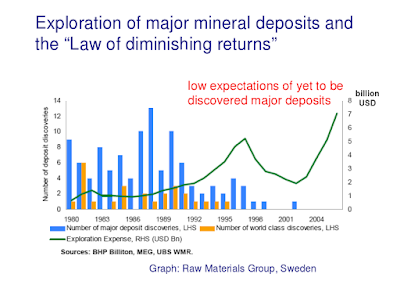 If that sounds too good to you, you are right; this optimistic vision that sees mineral resources as a pie is also firmly placing it in the sky. 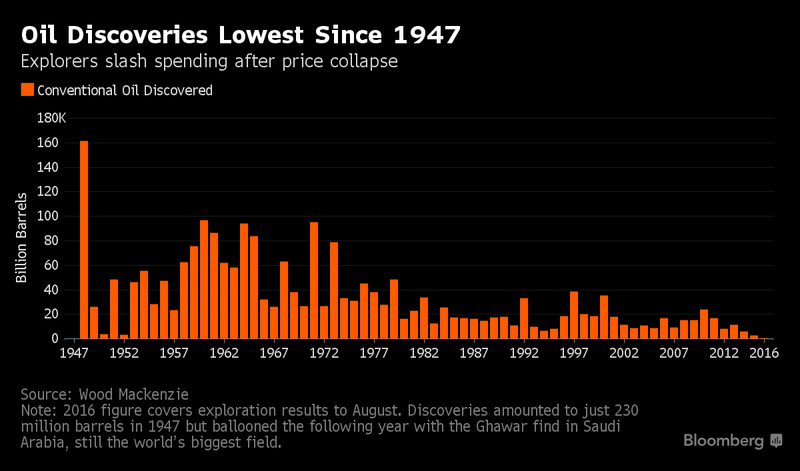 Just to raise a nagging question, let me cite a report that appeared in 2016 on Bloomberg (not exactly a den of Cassandras), titled “”Oil Discoveries at a 70-year low”. So, what’s going on, here? If these resources are there, how come that we can’t find them? Is this a conspiracy of the oil companies to keep oil prices high? A hoax that the Greens propagate in order to get people to vote for them? An attempt by a cabal of evil scientists who are aiming at obtaining research grants for their depletion studies? If one of these is the case, the coalition of these mighty powers seems to have been especially inept because the past few years have seen oil prices collapsing. But the crude oil world is especially ripe with conspiracy theories; including the one that sees oil as “abiotic” and being continuously formed in enormous amounts in the depths of the Earth – a “fact” that everyone would know were it not for the conspiracy of the oil companies, the Greens, the scientists, etc. That’s just one of the many legends pervading the Internet. Just one more expression of our teleological approach to problems that consists in finding evil human agents for explaining them. But there is no cabal, no hoax, no conspiracy in the estimates of oil and of other mineral resources. 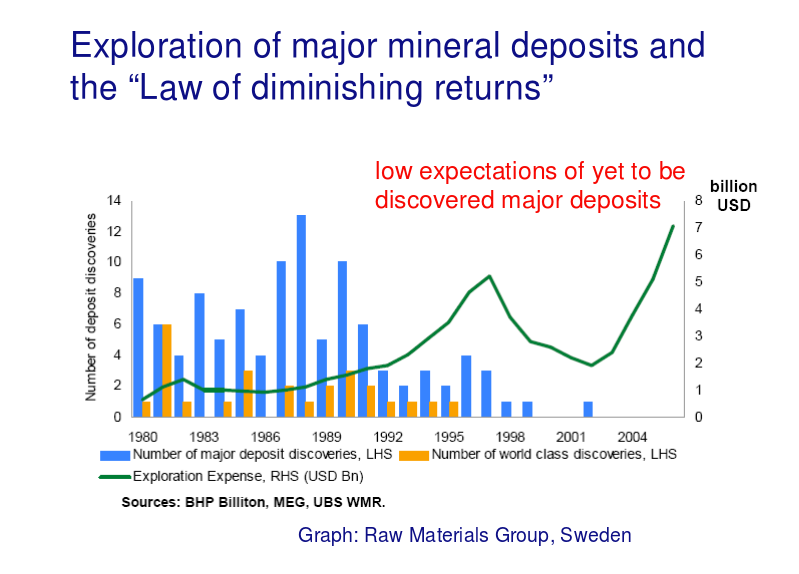 The problem is that using the R/P data to assess the future of mineral resources is misleading and it may easily lead you to a dangerous feeling of complacency. It is something that I call “Tiffany’s fallacy”. You probably remember the 1961 movie “Breakfast at Tiffany’s” that features the character played by Audrey Hepburn having breakfast while looking at the jewels on display in Tiffany’s windows. There is no doubt that there is plenty of gold on the other side of the glass, but it would be a fallacy to assume that one is rich just because of that. To get that gold, one must pay for it (or use dangerous and risky methods to get it). That’s the problem with the industry statistical estimates of “reserves.” These reserves are there, probably, but it takes money (and a lot of it) to find them, extract them, and process them. And it is not just a question of money, it takes material resources to extract minerals: drills, trucks, rigs, and every sort of equipment, including transportation and, of course, people able to use all of it. These are things that cannot simply be printed or obtained by magic financial tricks such as “quantitative easing”. Mineral resources are nothing like a pie that you can eat until you have some of it. They are more like Tiffany’s jewelry that you may get only if you have the money to pay for it. And the price of any commodity is directly related to its cost. It costs money to produce anything and nothing is produced if it can’t return a profit when it is sold on the market. So, in the case of minerals, extraction costs keep increasing because, of course, we extract the cheapest resources first. At some moment, we may find that we cannot afford anymore to pay for these costs. And when something costs more than what you can afford, you may as well say that you “ran out” of it, no matter what you read in terms of reserves that should exist somewhere underground. The mineral pie is shrinking and most of what’s left is in the sky.